Are you trying to lose weight, lower your cholesterol or stabilize your blood sugar levels? Or perhaps you would like to relieve constipation and improve your bowel movements? You can do all of this by simply increasing your fiber intake. Fiber has an abundance of health benefits and can easily be incorporated into your diet. Fiber has also been shown to reduce your risk of several diseases such as heart disease, type 2 diabetes, diverticular disease, and colon cancer. Males between the ages of 19 and 50 should aim for at least 38 grams of fiber per day, whereas females in that same age bracket should consume 25 grams per day. Males over 50 should incorporate 30 grams of fiber daily, whereas their female counterparts should aim for 21 grams. Bran includes quite a bit of fiber and can easily be added to many of your everyday foods, including salads, soups, or baked goods. Oat bran can help lower your cholesterol whereas wheat bran can help relieve constipation. One ounce of either of these adds 12 grams of fiber to your diet. You can simply sprinkle these onto your salads, soups, yogurt, or eggs. Bran can also be easily incorporated into the batters or doughs of your favorite baked goods such as pancakes, muffins, cakes, or breads. Just make sure you add a little more liquid to the recipe to make up for the extra fiber. You can also switch up the wheat bran for corn bran, which contains almost double the amount of fiber. Consider starting off your day with half a cup of a bran cereal, such as “Fiber One”. This cereal contains 14 grams of fiber. Top it off with your favorite berries for some added fiber and a variety of other beneficial nutrients. Berries are filled with an abundance of fiber, nutrients and powerful antioxidants. One cup of blueberries contains four grams of fiber, whereas one cup of strawberries contains about three grams. Raspberries and blackberries contain the greatest amount though, with eight grams of fiber per cup. Berries can be enjoyed fresh or frozen, providing the same nutritional benefits. Top off your cereal, yogurt and salad or enjoy them on their own. Just make sure to avoid any products that contain added sugars. Your leafy greens are usually the core of your salads and should be included in some way every day. Not only are they rich in B-vitamins such as folic acid, they add some fiber to your diet as well. 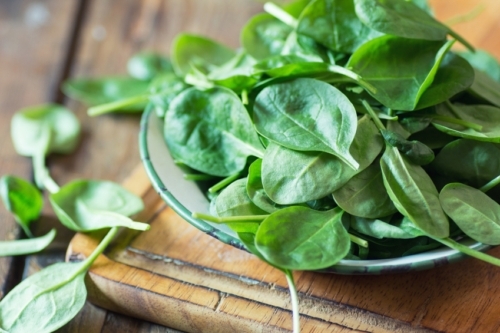 One cup of spinach or Swiss chard contains four grams of fiber, whereas one cup of collard greens, turnip greens, and mustard greens contains five grams of fiber. “Salad-haters” can also enjoy these greens by sautéing them and adding them to their omelettes, stir fry, or on their own as an added side dish. Beans are such a versatile food. Beans have recently become more popular as gluten-free options in the production of many flours. Beans are also used in traditional dishes such as salads, burritos, dips (e.g. hummus) and soups. They are a good vegetarian protein source and a great fiber option. The list of beans is lengthy and includes lentils, lima, kidney, black, garbanzo, pinto, navy, and white beans. One cup of any of these beans contains anywhere between 12 and 19 grams of fiber. While consuming one cup of beans is an easy way to reach your recommended daily fiber intake, make sure to introduce them gradually. The large amount of fiber can cause abdominal discomfort and gassiness. For those of you who are a bit more sensitive, it often helps to have smaller portion sizes or to soak the beans overnight before cooking them. Nuts and seeds are great vegetarian protein sources that also provide lots of fiber. Some nuts and seeds are also great sources of nutrients. For instance, almonds contain calcium and magnesium, whereas walnuts and flaxseeds contain omega-3 fatty acids. All nuts and seeds are also a great way to incorporate some of those healthy fats into your diet. Just be careful as these healthy, nutrient-dense foods can also add up in calories. Try adding some nuts or seeds to your salads, soups, cereals, or yogurt. You can also include them into some of your favorite baked goods, like muffins. You can get four grams of fiber in one ounce of almonds or one quarter of a cup of sesame seeds. One ounce of flaxseed contains eight grams of fiber, whereas one ounce of peanuts, Brazil nuts, walnuts or pistachios contains two to three grams of fiber. Palmer, S., “The top fiber-rich foods list,” Today’s Dietitian, 2008; 10(7):28.